Pub in Clapham. It was in the 2007 Good Beer Guide, but not subsequent editions. Has a theatre upstairs. As of 2007 food is served all day Saturday, 1pm-5pm Sunday, no food Monday. 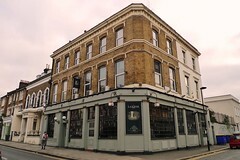 On a visit in December 2007, the beers available on tap were London Pride (£2.85/pint), 6X, and Greene King IPA. Last visited by Kake, Ewan, and other Tube Walkers, 22 December 2007. Opening hours and food details taken from the 2007 Good Beer Guide. Last edited 2013-12-03 05:30:42 (version 16; diff). List all versions. Page last edited 2013-12-03 05:30:42 (version 16).